It was all a bit electric blue at the allotment yesterday. Tomato and potato plants, with their leaves fighting to outdo the blue of the sky, all resemble pensioners emerging from under blow dryers. This is because we are now entering blight season. Blight is a fungal Phytophthora infestans disease that loves a British summer with its dampness and occasional warmth. It kills the plants slowly, rotting the underground potatoes and turning the tomato fruits black and putrid. You watch for signs of blight at the end of June; brown freckles on the leaves are the first indication. There is no time to delay, no time to look up clever solutions, the only answer is Bordeaux Mixture. This answer to blight was also the solution to the great Irish famine of 1845 to 1849. The Irish, farming only one or two potato varieties, had no chance when blight hit them and the crops failed again and again. The spores of the fungus can remain active in the ground for years and blow in the wind and no one could see a way out of the problem. It’s one of the reasons why so many Irish people at that time emigrated to America, they went to find food and work. However a scientist in Bordeaux had earlier noticed that blight, which also affects vineyards, didn’t occur on grapevines near the road. Further investigation revealed that those grapes had been sprayed in a typically robust French solution to the problem of grapes being eaten by passers by. Simply poison the passers by. Bordeaux Mixture is in fact classified as an organic product, as copper sulfite is a naturally occurring substance and when washed off the fruit it has no nasty side-effects on digestion. The EU however are annoyed that Bordeaux Mixture was invented before they had a chance to spend a lot of money testing it and now want it taken off the shelves for a few years while they slowly do so. The fact that it’s been used for over 100 years with no apparent ill effects to the population, apart from to grape scrumpers, does not impress them. We allotmenteers are now busy stockpiling the stuff in case a ban does come in. The approved alternative to Bordeaux Mixture, Dithane 945 is inorganic and doesn’t even have such a nice name. So when you see us marching up and down spraying our spuds and toms, don’t be too quick to cry foul. We haven’t succumbed to the lure of easy inorganic gardening, we are just keen to save our crops. 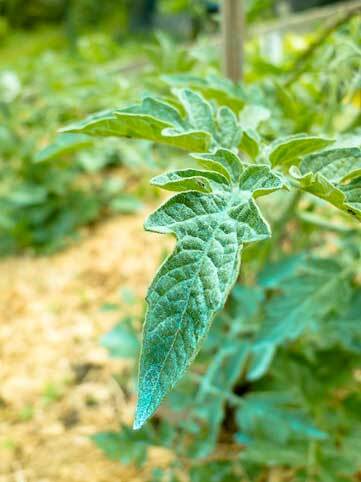 And if any passer-by gets sick by eating a blue tomato, well then they have only themselves to blame.